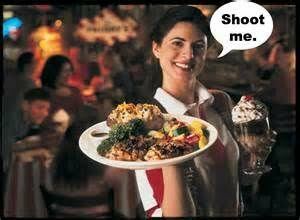 I was a server for two-and-a-half years post college graduation. Immediately following that, I became a mother. Few things in life have prepared me for parenthood like my stint in the service industry. Just like raising kids, waiting tables was hard, humbling work. I don’t want to give the name of the restaurant where I worked away, but it may or may not have rhymed with TGI Shmidays. Frankly, the similarities between serving and parenting are a little too spot-on. There is a term that restaurant staff use to describe their situation when they are really, really busy – it’s called being ‘in the weeds.’ It’s been over five years since I have waited tables, but I still have nightmares about this scenario. All six of your tables need refills, the kid at table 20 just spilled his drink, table 21’s food was ordered 25 minutes ago and they are giving you the stink eye, table 22 has a gift card to use and the machine to validate it is broken down, and table 23 has just informed you that someone at their table has a birthday which means that you have to make their free sundae and lead a troop of fellow servers while you belt out a solo in the middle of a crowded restaurant on a Saturday night. Fun times are had by all. Did I mention that this stroke-inducing stress will only render you approximately $12 in tips? I have just walked in the door from work and find that my kids have barely napped. I quickly change my clothes, assess the fridge for dinner, defrost some meat, sit down for five seconds, immediately receive a request for a sippy cup refill, fill the cup, sit back down, smell a poopy diaper, change the diaper, get the defrosted meat, brown the meat, pick up a fussing kid, cook with one kid on my hip and another one at my legs, avoid burning everyone, set the food down on the table, pray for our meal, a kid puts too much food in his mouth and barfs, clean up the barf, get the other kid more to eat, now everyone needs drink refills, sit down to take my first bite and it’s cold. Guess what – I’m back in the weeds. It turns out, when you ‘86’ something, it means you are all out of it. I used to love it when guests would come in and ask for something right off the bat, which, of course, would be the one thing that you were completely out of. Then they would complain the rest of the time and continue to ask for that one item for the duration of their dining experience. What did they want me to say? “Now that I’ve handed you your check, I just wanted you to know that I’ve been messing with you this whole time and we’ve had macaroni and cheese bites all along!!! Muahahaha. I’m trolling for tips, people. I want those mac-n-cheese bites as badly as you do. I don’t know that I have been able to eat more the three vanilla yogurts in my own home in the past three years. We are always out of it. It is no sooner unpacked from the grocery store before it is flying out of the refrigerator. I was putting the laundry away the other day, came downstairs and found that my son had slammed two yogurts while I was upstairs. Obviously, they were the last two yogurts we had. For the rest of the night, that same son continued to ask for more yogurt. Why didn’t we have any? Where did it go? I’m sorry, did you black out while you housed all of the yogurt that we had? You know that it is all gone and no, I do not know how to make yogurt. I checked the fridge one last time and found that we did have one more yogurt – it was strawberry. Wailing ensued. It.must.be.VANILLA! 86 that. Sure, I remembered the nice customers and the once that tipped well. Ideally, they would be both nice and great tippers. BUT, the jerky jerk guests were imprinted on my brain. I would see them walk in the door, see the hostess grab the menus, see her start to head toward my section, see her set them down at my table and then walk away. Things just got real. Contrary to popular belief, there are a lot of things that a server has no control over. It would drive me nuts when a guest would say, “this will reflect in your tip…” Oh, really??? At least with them, you knew not to expect a decent tip. The ones that really got me were the guests who ran me around for an hour and fifteen minutes and then would leave NO TIP AT ALL on the table. Just because our titles literally mean that we are servants, does not mean that we are less than or are not working insanely hard. Servers remember you and they remember how you treated them. I can’t even count the amount of times I had to just walk away to keep myself from saying something mean in return to a rude guest. I have to admit, there have been times when I have been drawn into a verbal ‘negotiation’ with my kids. When frustrations are high, it’s so easy to do. If it’s not a negotiation, then my sarcastic nature will rear it’s ugly head. When my kid wakes up from a nap and promises to behave better than he did that morning, I have to bite my tongue. I want to tell him that he better behave because he was being a real poophead earlier and I can’t take much more of it. Instead, I just give him a hug and we move on. Most of the time, I can remember that I am the adult and they just learned how to use the toilet, so maybe arguing with them is not the most productive thing that I could do. Many days (like getting stiffed on a tip), there seems to be nothing to show for all of the work, but you just show up, keep your mouth shut, and do it anyway. Whenever a meal was ordered incorrectly or there was an extra meal for any reason at all, my co-workers and I would jump on that freebie like no other. I would take my meal to the back of the restaurant in a dark corner and shovel that food into my mouth as fast as I could. Inevitably, I would burn my entire mouth and get extreme indigestion, but it was totally worth it. I couldn’t afford to spend my tips on Cajun Chicken and Shrimp Pasta even with my discount. So a treat like that was hard to come by. I cannot tell you how often I don’t get to eat a real dinner. I’m usually too tired to cook and if I do make a home-cooked meal, the kids are suddenly not hungry. Most of the time, I just make them something then eat their scraps over the sink like some sort of rat while I clean the dishes. It takes me back to the good ol’ days of hiding out in that dark corner at work in between checking on my tables. Bedtime is the new last call. There is something about it that makes my kids request more things than they did the rest of the day combined. They need water, they need their blankies, they are suddenly interested in reading books, they need songs to be sung, they need you to do a River dance, they need their backs rubbed, and just when you think you are done, they will get out of bed and come downstairs to ask for something else. Bedtime is my cardio routine. Right before I finally got a job that launched my career, a frequent guest of mine came to the restaurant and asked why I continued to serve when I was educated. Basically, he was insinuating that I was too good to work there. I stopped for a moment and responded truthfully. Other than the fact that there were no jobs to be found, I told him, “When I first started as a server, I believed that I was too good for this job. But nothing has taught me more about humility and grace than serving others. No one is ever too good to serve.” See what I did there?? Pretty deep for someone who was ‘just’ a server. There were many days when I was waitressing that I felt like the worst version of myself. I was bitter and angry that this was how I had to make a living and I was frustrated with the way people treated me. Motherhood is much the same. I will lay my head down at night and feel as if I did nothing right throughout the course of the day and I am constantly surprised (and disappointed) by my reactions to things both large and small. But I pray, ask for forgiveness, and my slate is cleaned. Parenting is one big sacrifice. You serve others daily, often with little appreciation. It is all about humility, perseverance, and more grace than you can even imagine. But it will teach you more about yourself and what you are capable of than any other job this world has to offer. I cannot conceive of a life without my kids. They have shown me what an incredible blessing it is to be able to serve others. Plus, both experiences have given me enough stories to write a book.